If a patient does not want a root canal completed on their tooth, we may be able to avoid a root canal with one of the techniques described below. If that is not possible, then the tooth can be properly removed and an implant or other treatment can be performed to replace the tooth. If a patient wants to save the tooth and one of the procedures described below cannot be performed, then a biological root canal can be performed. The following are two cases demonstrating my use of ozone to prevent root canals on teeth with advanced decay. Keep in mind that this procedure cannot always prevent the need for a root canal procedure or extraction of the tooth. Tooth prepared for a filling. Dark stain is advanced decay (L). Decay removed but nerve is exposed (bleeding) (R). pulp tissue. The tooth then received a permanent filling (not shown). Basic pulpotomy procedure. First the cavity and infected portion of the pulp (nerve) is removed. Then a biocompatible dressing is placed over the remaining nerve and finally a permanent filling or crown is placed on the tooth. 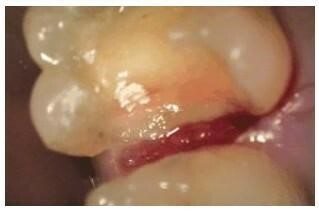 with dental dam and amalgam filling removed showing decay (R). to excavate (clean) nerve is exposed (bleeding) (R). Infected part of nerve is amputated (pulpotomy) exposing healthy nerve deeper in the canals (L). 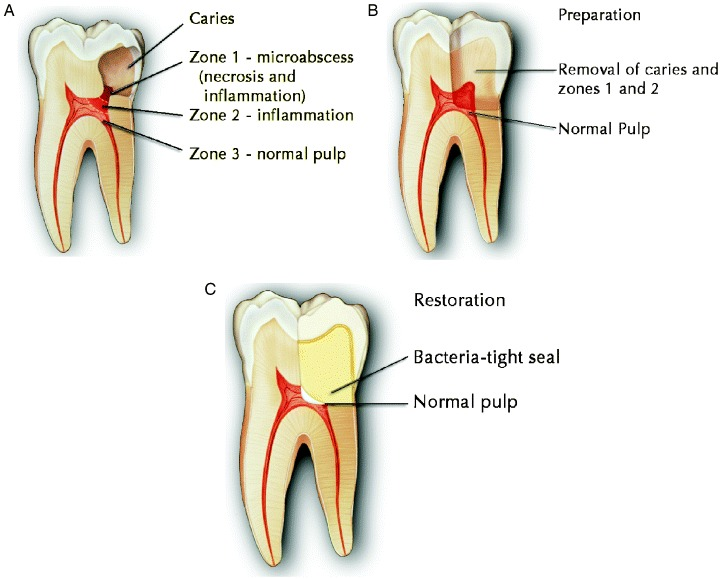 The remaining pulp tissue was treated with oxygen-ozone and a biocompatible filling (R). The tooth then received a ceramic crown (not shown).